Research and development are the essential building blocks for the advancement of new ideas. Whether it occurs in Silicon Valley or the local schools, funding for R&D is the fuel that propels innovative ideas to become sustainable new methods of delivering knowledge. One new idea that is growing within the elementary schools is the use of iPads to improve reading fluency and comprehension. Colleen Durepo, a fourth-grade teacher at North Falmouth Elementary, was looking for ways that she could motivate students to be more active participants in their learning. In 2013, she proposed to FEF the purchase of iPads and apps that allow students to use multimedia (voice, animation, images) to create and share their own stories and presentations, and more easily access difficult text. Evaluation showed that the project was successful in improving students’ test scores and motivation; all 22 students increased scores in comprehension and fluency, and 28 percent increased enough to move to a higher percentile rank. Through assignments and classroom observations, she noted an increase in motivation and engagement in all her students. Durepo’s success prompted the Foundation to help her expand the program to all fourth-grade classrooms at North Falmouth Elementary for the 2014-15 academic year. The intellectual marriage between art and science in the Falmouth schools is an area in which Foundation funding has allowed teachers to take full advantage of our town’s vibrant scientific resources. Among the first grants the Foundation made was one that supported an artistic approach to learning about oceanography. Today, those collaborations continue to grow. During the 2013-14 school year, Falmouth High School teachers Cheryl Milliken (science) and Corine Adams (art) raised awareness about the impacts of marine debris in the ocean by conducting a beach survey and cleanup, and using the marine debris they collected in a sculpture. 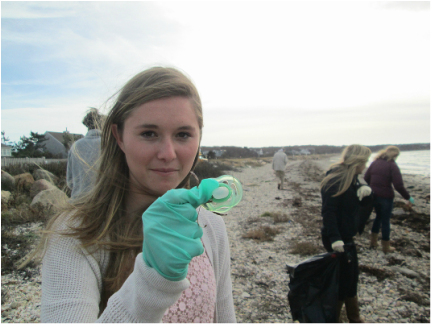 Students in the Marine Ecology classes at Falmouth High School learned first-hand about the impacts that humans have on the health of coastal ecosystems as a result of marine debris in the water and on the shore. They completed beach surveys at Woodneck and Bristol beaches in October 2013, and collaborated with COASTSWEEP, the statewide coastal cleanup sponsored by the Massachusetts Office of Coastal Zone Management, to collect marine debris and report their findings. Within a half-mile stretch of shoreline, some 20 students collected six pounds of debris. In addition, they conducted water quality testing and marine life assessments in the salt ponds behind both beaches. “Students have enjoyed interacting with the local marine life and seem to have a greater appreciation for it now that they have seen what lives beneath the surface of our salt ponds,” Milliken said. Once the debris was collected and documented, it was turned over to Corine Adams’ Ceramics 3 class, which built a three-dimensional sculpture out of the debris collection. The sculpture was on display at the FHS Science and Engineering Fair, as well as in the Science Gallery at FHS.